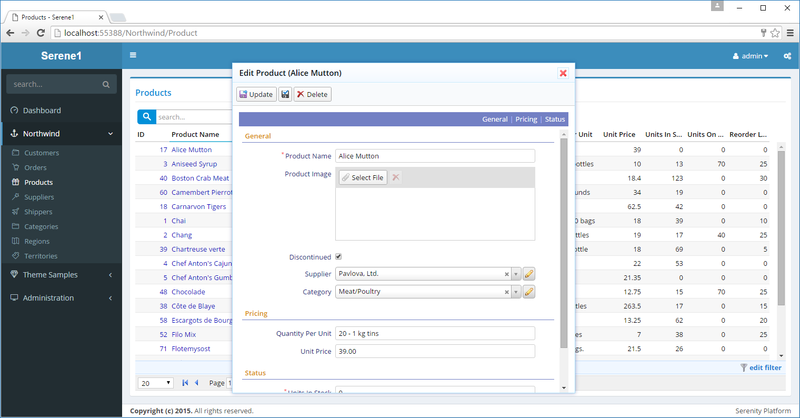 When you click a product name in Products page, an editing dialog for that row is displayed. This dialog is shown on client side, there is no post-back happening. Data for the clicked entity is loaded from server side using an AJAX request (only data, not markup). Dialog itself is a customized version of jQuery UI dialog. In this form we have three categories for fields: General, Pricing and Status. By clicking category links on top blue bar you can navigate to start of that category. Each form field occupies a row with label and editor. You may choose to show more than one field in a row if required (with CSS). Fields marked with "*" are required (cannot be empty). Each field has a specific type of editor tailored to its data type like string, image upload, checkbox, select etc. Every field has a separate "div" of its own with class "field". Inside this div, there is a "label" element and another element (input, select, div) that changes with the editor type for that field. In the toolbar we have a button to save current entity and close dialog (Update), next to it a smaller one that keeps dialog open after save and another one to delete current entity (obviously). Most Serenity editing dialogs has this familiar interface, though you can always customize buttons, fields, add tabs, and other interface elements.